The Security Tool of the Linksys Smart Wi-Fi has three (3) major features that give you control over the protection of your router and your home network. A software Firewall protects your local network from Internet threats by filtering the incoming and outgoing communications of your router. VPN Passthrough - A Virtual Private Network (VPN) uses a public network, such as the Internet, to provide secure communications between a remote computer and another network. IPSec Passthrough – The Internet Protocol Security (IPSec) is a suite of protocols used to implement secure packet exchange. PPTP Passthrough – The Point-to-Point Tunneling Protocol (PPTP) allows VPN clients to establish a PPTP tunnel through the router. L2TP Passthrough – The Layer 2 Tunneling Protocol (L2TP) enables VPN clients in the local network to establish an L2TP tunnel through the router. This feature allows you to customize IPv6 for port services or applications. When users send these types of requests to your network via the Internet, the router will allow those requests to the appropriate computers. Internet filters – Enabled filters help with the general security when you’re already connected to the Internet. Filter anonymous Internet requests - This feature blocks ping requests from computers on the Internet to your router. 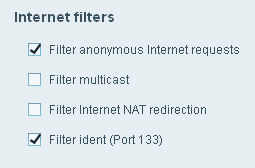 Filter multicast - Multicasts are similar to broadcasts; by default, they are sent to all computers in a network. This option blocks multicasting. Filter Internet NAT redirection - This feature prevents a local computer that's using a URL or Internet Address in your network to access your local server. Filter ident (Port 133) - This feature prevents outside intruders from accessing your router through the Internet using service port 133. Some applications may require this service port to be available. If this is the case, disable this option. The Demilitarized Zone (DMZ) is a feature that forwards all inbound ports presented in the WAN interface, except those that are specifically forwarded, to an IP Address or MAC Address. This feature can be used to expose a web server, mail server or web camera to the Internet so anyone can access it. QUICK TIP: This feature is not typically used as it presents significant security risks to the device that you designated on the DMZ. The device is not protected by the built-in firewalls, Internet filters, or router web filters. The settings under the Apps and Gaming tab can help you optimize your connectivity without running the risk of being completely vulnerable. These special features are generally used when accessing your data remotely or permitting communications in private networks. DDNS – The Dynamic Domain Name System (DDNS) feature lets you configure a domain name for your home network, which you can then use to easily find your network on the Internet. This is useful if you want to remotely access a USB drive or web camera over the Internet. Single Port Forwarding – This feature forwards inbound traffic from the Internet on a specific port to a single device in your local network. Port Range Forwarding - This feature forwards inbound traffic from the Internet on a range of ports to a specific device on your local network. Some applications can use a range of ports so that, if one port is busy, the signal can be forwarded to try and pass to another port. Port Range Triggering – This feature allows the router to watch outgoing data for specific port numbers. The IP Address of the computer that sends the matching data is remembered by the router so that, when the requested data returns through the router, the data is routed back to the appropriate computer. This is useful when using a USB or Bluetooth headset for online chatting and gaming.